The high cost of living in Tofino and on the west coast is keeping the doors of Tla-o-qui-aht’s new day care and preschool closed, according to those working to open the facility. “Even if people go out to get training from the west coast, very few will come back because of the high cost of living on the west coast.” said Tla-o-qui-aht Education Manager Iris Frank,. The Tlucha facility, Tla-o-qui-aht’s new 42-child daycare and preschool, was completed and ready for equipment and supplies in early December 2017. The facility, said Tlucha Facilities Manager Carol Frank, was built with the goals of preparing children for entry into kindergarten and Grade 1 and to accommodate the needs of a growing population. The demands on the Head Start/preschool program increased dramatically with the creation of the new community in Ty Histanis as well as a general increase in Tla-o-qui-aht’s population from 900 to over 1,144 in the last decade. A childcare aspect was included with the new facility to help parents seeking to return to work or school, or for those that can benefit from some added parental support. Frank said that childcare licensing, administered by the Vancouver Island Health Authority (VIHA), requires staff have specific qualifications. These include Early Childhood Education (ECE) to provide care for three and four year olds and ECE with an infant and toddler speciality to provide daycare services for babies to three year olds. Currently the facility has five staff, including two ECE assistants and educators. To fully operate fully three more certified staff are needed: one with ECE and two with ECE with Infant and Toddler Specialization. “You may have noticed that the early childhood educators and infant and toddler positions have been posted at least four times. The infant and toddler position is key to opening that program in the daycare,” stated Carol Frank in a recent Tla-o-qui-aht Newsletter. With the cost of living on the west coast being higher than anywhere else on Vancouver Island and second only to Vancouver, it is hard to attract and retain certified early childhood educators, said Iris. The Clayoquot Biosphere’s Trust 2017 Living Wage report assessed a living wage on Vancouver Island’s west coast to be $20.11 an hour based on two working adults and two children in a house. The $20.11 an hour figure trumps Victoria’s living wage of $20.01 and Parksville’s of $16.44. Additionally, the Clayoquot Biosphere’s Vital Signs report states food costs are up to 17 per cent more on the west coast than in neighbouring Port Alberni. The average starting wage for an early child educator without a specialization is approximately$18 per hour. 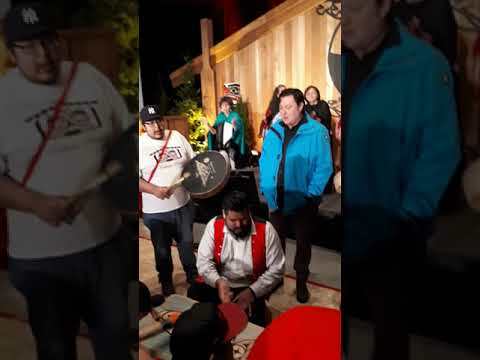 The First Nation’s Education Manager Iris Frank said the problem isn’t just affecting Tla-o-qui-aht, but the two neighbouring municipalities of Tofino and Ucluelet, as well as Ucluelet First Nations. That’s not the end of the story; it’s the beginning of a new one. Iris Frank shared that Tla-o-qui-aht were successful with a funding proposal to host a North Island College ECE program on the west coast, a course that is anticipated to start in April of this year. “We’re doing our best with the goal to get as many TFN people as possible eligible to take the course,” said Iris. A prerequisite to take the ECE course is a minimum mark of “C” in English 12. Iris said 15-18 people have gone to take assessments with North Island College. While the kids are not in the new Tlucha school yet, everything has been taken out of the old facility, cleaned and set up in the new facility. Iris added that she hopes the licensing process will be complete for Head Start (three and four year olds) by the end of January, thereby allowing the program to operate at that time.